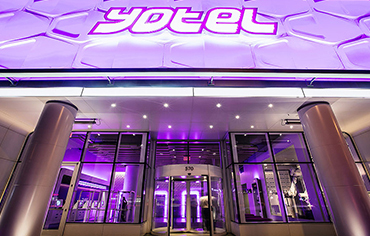 YOTEL New York is a new breed of hotel, combining its modern, futuristic style with high-tech services. The trendy mid-town hotel received a full electrical upgrade from Arcadia Electrical, who installed a low voltage package for the hotel on the side of the building, including all guest rooms and public areas. This work included data, telephone, RG-6 coaxial, security cameras, heliax cabling, distributed Antenna System and Wi-Fi. Arcadia Electrical built the main distribution room (MDF) room in the basement and intermediate distribution frame (IDF) closets on every other floor. These rooms included plywood, ladder rack, copper and fiber patch panels and 66 blocks. The riser wires were installed from the basement to the 26th floor, which included RG-11, Cat-6, 12 strand fibers, heliax cabling, among other wirings. Arcadia Electrical installed the A/V system (HDMI, VGA) on multiple floors including the outdoor entertainment area on the roof.